The card today is the last of the four cards that I made to put into the card gift box. It started with the pink patterned paper label and went with the pierced circle on top. I wanted to add some patterned paper behind the label but also wanted to emboss the background, so used a strip of paper and cut out a fish tail and then you could still see the background. I added 3 small strips of paper, which I cut these into a fishtail as well, under the label to add a little more colour and chose some blue patterned paper for the flowers and butterflies. 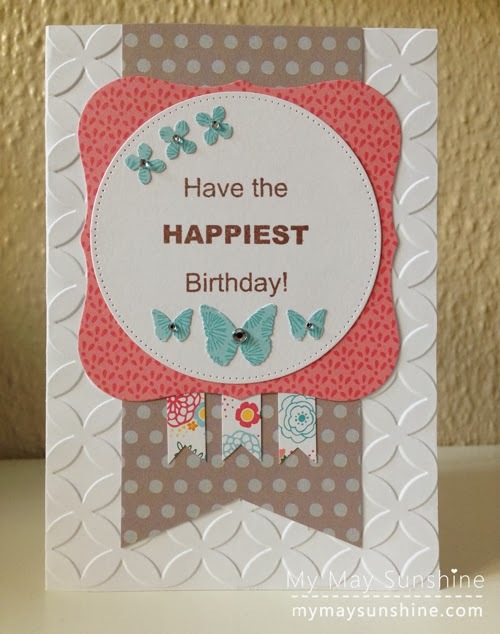 I kept the embellishments simple and just added some gems to the flowers and butterflies to make them sparkle. Paper – American Crafts My Girl | Stamps – My Pink Stamper Fabulous Phrases | Butterflies – Martha Stewart 3 in 1 monarch butterfly punch | Flowers – Martha Stewart 3 in 1 hydrangea punch | Circle – Die-namics pierced circles | Label – Spellbinders Nestabilities label one | Embossing folder – Cart-us Trendy circles | Gems – Hobbycraft.